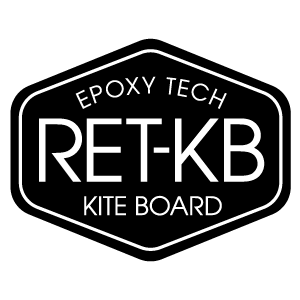 Roberts Epoxy Technology-Kite Board (RET-KB) uses stringered EPS blanks, epoxy resin, fiberglass and carbon strips. RET-KB construction is designed for strength and controlled flex to handle the extreme speeds, quick turns and giant airs found in high performance kite surfing. RET-KB constructed boards start with 1.7lb EPS stringered blanks from Marko Foam. Wider than standard stringers, made from 6 mil Poplar are used for added strength. Glassing consists of the highest quality epoxy resins and fiberglass. Our standard glassing schedule for RET-KB stock or custom boards is two layers of 6oz fiberglass on the deck and a layer of 4oz and a layer of 6oz fiberglass on the bottom. To add more strength and control flex, 3” wide aircraft grade carbon strips are glassed down the full length of the stringer on both sides of the board. Options include: bio resin, 2.0 lb EPS blank for added strength and weight, and changes in the glassing schedule to adjust weight, strength and flex.